Israel has carried out dozens of air strikes on Palestinian militant sites in Gaza in retaliation for the firing of two rockets towards Tel Aviv. The rocket fire, which did not cause damage or injuries, was the first to target the Israeli city since 2014. Four people were wounded in the strikes on Gaza. Israel’s military said a headquarters of the militant group Hamas was among the targets. Hamas, which dominates Gaza, insisted it was not behind the rocket fire. Israeli media are citing an Israeli defence official as saying that the rockets may have been launched “by mistake” while maintenance work was being carried out. Air raid sirens sounded across Tel Aviv metropolitan area on Thursday night for the first time since a 2014 war between Israel and militants in Gaza. An explosion was heard in the city centre. At first it was believed to have been from a rocket being shot down, but the Israel Defense Forces (IDF) said no rockets were intercepted and that it assumed they had landed in open areas. 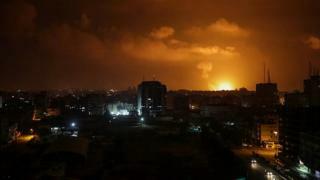 Shortly after midnight, Israeli jets and helicopters attacked dozens of sites in Gaza belonging to Hamas and the Islamic Jihad group, Hamas sources said. The IDF subsequently announced it had hit about 100 Hamas military targets. It said they included an office complex in Gaza City allegedly used by the group to orchestrate attacks in the occupied West Bank, an underground facility that was the main manufacturing site of standard-grade rockets, and a military training site that served as a centre for unmanned aerial drones. Gaza’s health ministry said four people were injured including a man and a woman whose house in the southern town of Rafah was hit. Air raid sirens again rang out in Israeli towns close to Gaza overnight and on Friday morning. The IDF said nine more projectiles had been launched, six of which were intercepted by the Iron Dome air defence system. IDF spokesman Brig-Gen Ronen Manelis said the initial rocket fire had come as a “surprise”, and that there had been no advance intelligence warnings. No militant groups have said they fired the rockets at Tel Aviv. Hamas insisted on Twitter that its armed wing was “not responsible”, while the Hamas-run interior ministry in Gaza said the rocket fire went “against the national consensus” and vowed to take measures against the perpetrators. Hamas added that the rockets had been launched during a meeting with Egyptian mediators attempting to broker a long-term truce between Israel and Hamas. The organising committee of a months-long Palestinian protest campaign also announced that Friday’s weekly demonstrations along Gaza’s border with Israel had been called off “in keeping with the public interest”. Later, a Hamas official told the Associated Press that an agreement to restore calm had been reached. The flare-up comes just over three weeks before Israel holds a general election, and two months before Tel Aviv is due to host the Eurovision Song Contest.